We lived in an area for several years where we did not really have a changing of the leaves in the fall, no red leaves or big leaf piles for jumping. The leaves fell in the late fall or right before the trees were to get new leaves in early spring. We missed seeing the transformation of the leaves in the fall from green to bright reds, yellows, and oranges and eventually brown. This fall tree craft explores all of these colors as well as texture and sound while working on fine motor skills. Crepe paper (brown brown, red , yellow , orange) You could also use tissue paper. 1. Make a tree trunk from the brown paper. 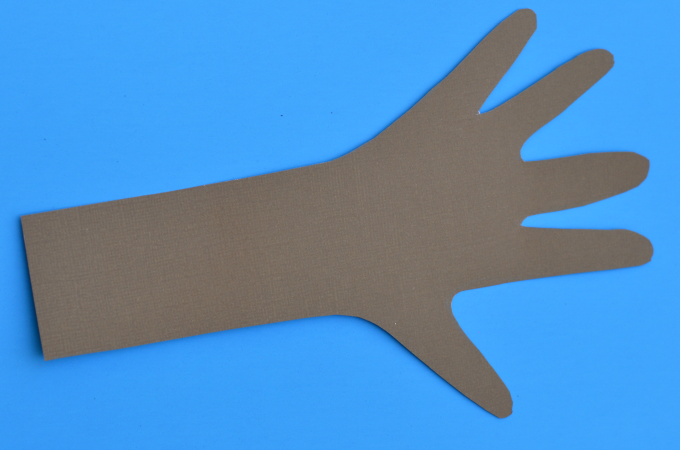 We made this by tracing the kids’ hands and arms on brown paper and then cut them out. After completing the project we realized we had covered most the hand. Unless you want to use the fingers as a guide for placing the crepe paper leaves, skip the tracing and just cut a tree trunk from the brown paper. 2. Glue the trunk to the background paper. 3. Tear small pieces of crepe paper, crumple the pieces, and glue to the hand to make leaves. Kids love tearing paper, and as an added bonus it helps them develop their fine motor skills, which leads to good pencil grasp and handwriting. I love using crepe paper to make this fall tree craft. It has a texture and makes a sound when it crumbled just like leaves. Encourage kids to use their senses while making this craft. Kids can feel the texture of the crepe paper and hear the paper as they crumble it to make leaves for their trees. If you are doing this with younger kids, review the colors used to make the leaves for this fall tree craft. Get outside and jump in some leaves. Who can resist a big pile of leaves! Go on a nature hike and challenge kids to find a red, yellow, orange, and brown leaf. We used a glue stick. We applied the glue to the paper and then added the crepe paper. School glue would work as well.